Parakeets are very social birds and can be affectionate with humans if they're socialized and trained. Start your parakeet at a young age and work with him daily to make him a friendly, trusting bird, and he will show affection. Parakeets are one of the varieties of pet birds who are eager for companionship. When you bring your bird home, settle him in his cage in an area of your house where there's lots of activity and opportunities for him to be around people. Give him a few days to get used to your home, and then begin his training. 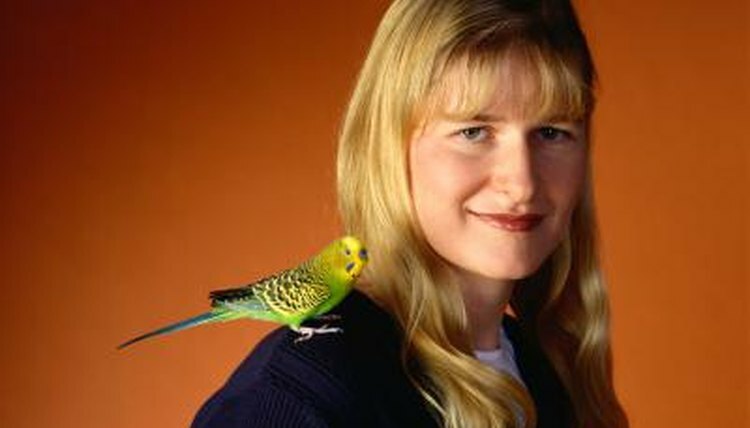 Begin socializing your parakeet by getting him used to your voice. Parakeets are known for repeating words and phrases, so get to know your bird by talking to him frequently. Repeat words or phrases that you want him to learn. Sit next to his cage for a few minutes each day and accustom him to your voice and your presence. Once he's comfortable with you, you'll see him cocking his head as he listens to you. Once your parakeet knows you, teach him to perch on your finger. Start by placing your hand inside the cage, holding a small treat. It may take a few days before your bird takes the treat. Be persistent. Once he takes the treat, repeat this for several days. Then lightly press your forefinger against the bottom of his breast, just above his feet, and give a command such as "up." Your parakeet will climb onto your finger. Once you can handle your bird and he's comfortable on your finger, allow him to sit on your shoulder. A parakeet will show affection by chirping at you and lightly pecking at your hair or ear. A parakeet who is socialized when he's young is more apt to be an affectionate pet, so begin training as early as possible. These birds enjoy social stimulation and given an opportunity, can be affectionate pets.